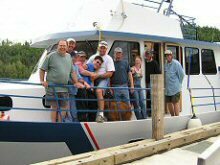 CRUISE IN COMFORT AND STYLE! 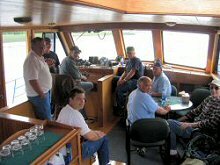 The Nighthawk II was built on Lake Erie in the late 90's and upon completion was sailed through the Great Lakes to the Nipigon area. We custom designed the Nighthawk II to optimize the comfort of our clients. 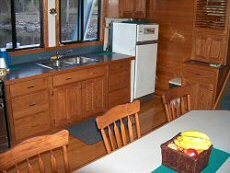 Roomy, with high ceilings and a spotless, bright interior, our guests never feel crowded. 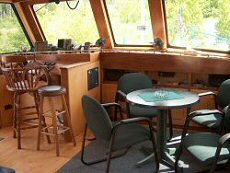 The luxurious interior, finished in oak, black walnut and cedar, is designed on two levels--the upper level features a roomy wheelhouse and a large galley. 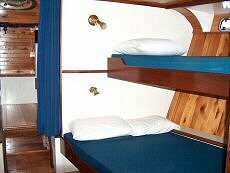 The lower level provides sleeping accommodations for ten and a full sized shower and head. 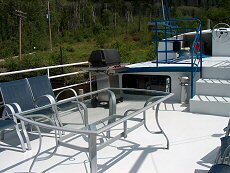 For relaxing after a day of fishing or enjoying the view, we also have comfortable lounge furnishings and a barbeque on our spacious upper sundeck. This is the perfect vantage point for stargazing--the night sky sets the stage. Occasionally, the aurora borealis displays arcs of shifting colour against the clear summer sky. 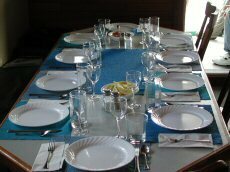 Delicious, home cooked meals are a highlight of your trip. 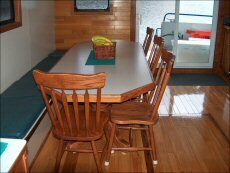 Hearty stews, steaks, pastas, fresh fruits and vegetables are prepared in our fully equipped galley. Of course, your catch of fresh fish compliments our menu as well. Notify us in advance--we are always happy to meet any special dietary requirements.